If you’re thinking about it, you’ll likely benefit from therapy! There’s a common misconception that therapy is only for people who are in crisis. But you don’t need to have an emergency to come to therapy. Counseling can help you gain clarity, purpose, and direction in life to help you feel more at ease and allow you to enjoy your life. No problem is too small or too big for therapy! Online counseling is done via secure video conference. There are no recordings of the sessions. You can use any internet connected device (laptop, desktop, smartphone, tablet, etc.) with a camera. You’ll want a good internet connection that’s strong enough to stream Netflix or other streaming video service without difficulty. Otherwise, online counseling works just the same as in-office therapy. You can read more about online counseling here. Sessions are weekly to start. This helps us gain momentum towards achieving your goals. As things progress and you’re starting to feel better, we can talk about reducing the session frequency. Everyone is different; however, my approach is solution-focused. We will get clear on what your goals are and determine together the best way to get you there as efficiently as possible. Some things can’t be rushed, but I don’t keep people in therapy forever. The initial intake session is 60-75 minutes and is $200. Every session after that is 45 minutes and $150. 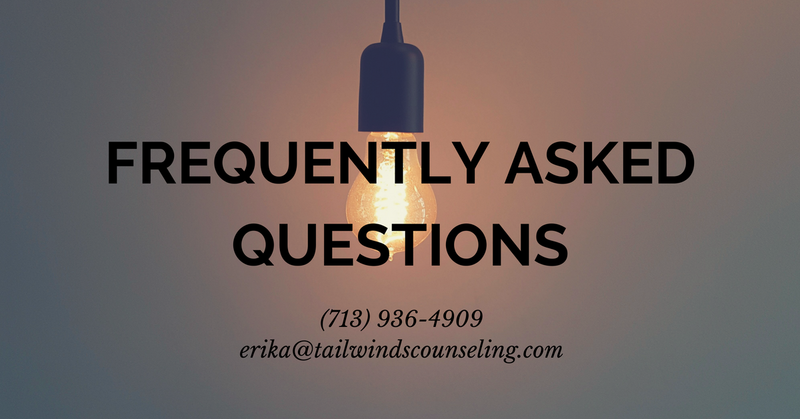 Tailwinds Counseling is private pay only; however, you can use funds from your FSA or HSA. It may be possible to use Out of Network benefits if you do not have an HMO plan. You can read more about this here. A small number of reduced fee slots are sometimes available for need-based clients. Call or email to determine availability. A limited number of significantly reduced rate sessions are available through Open Path Collective. You can check availability here. You can pay by credit card, debit card, HSA, or FSA. Tailwinds Counseling uses Ivy Pay. It’s a private, HIPAA compliant way to charge your card and protect your privacy. Absolutely! You can schedule an appointment here. I can’t find an appointment time that fits! Shoot me an email with some times that work and we’ll try to find a time that works for both of us. Appointments must be canceled at least 24 hours prior to the appointment time and 72 hours prior to Monday appointments.